From the Admin tab, click Administration > Activity Input > Initiate Faculty Input. 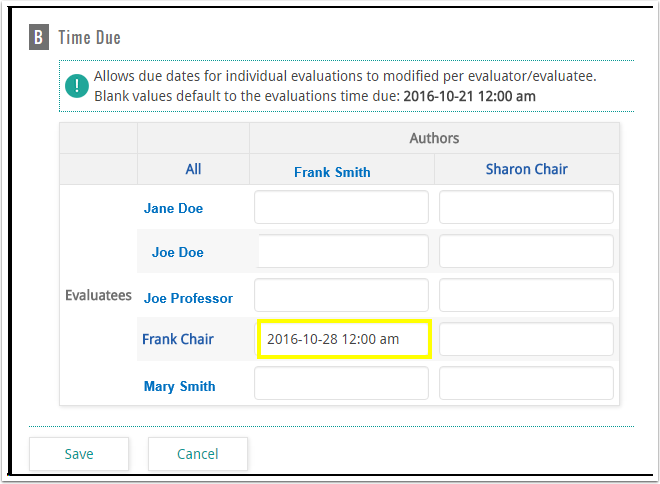 Start Date and End Date: Enter a start and end date to limit the results to workflows with the Faculty Input Opens and Faculty Input is Due dates within the date range specified. Workflow Form: Select a workflow from the list to limit the results to workflows using a specific form. Click the Refresh Report button. 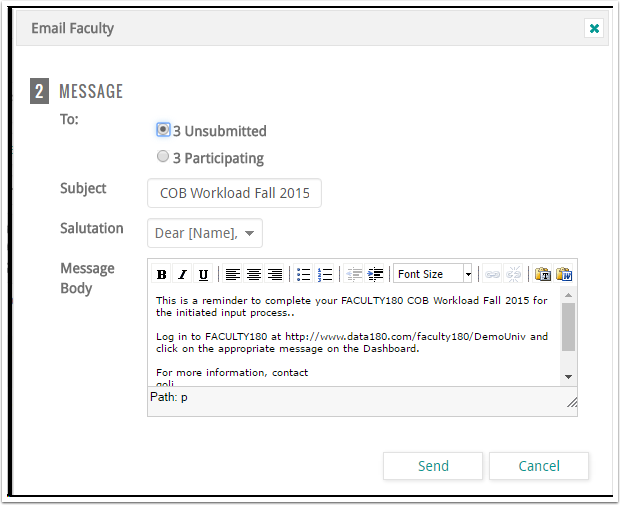 An email icon has been added to the Approve Faculty Input page. Clicking the email icon provides the option of emailing all participating faculty, or only those that have not submitted. 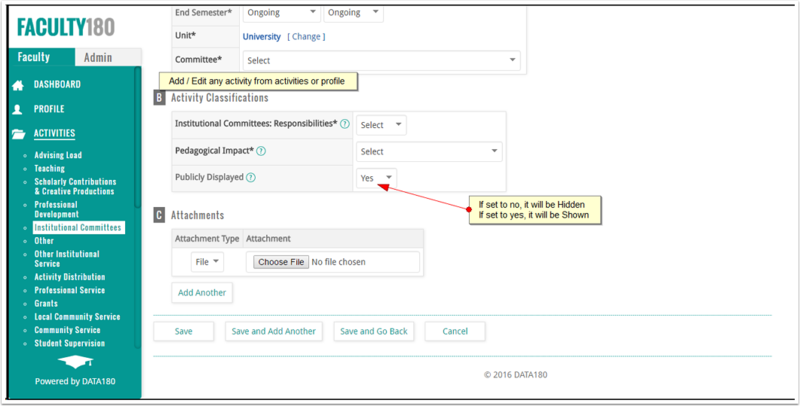 From the Admin tab, click Administration > Activity Input > Approve Faculty Input. 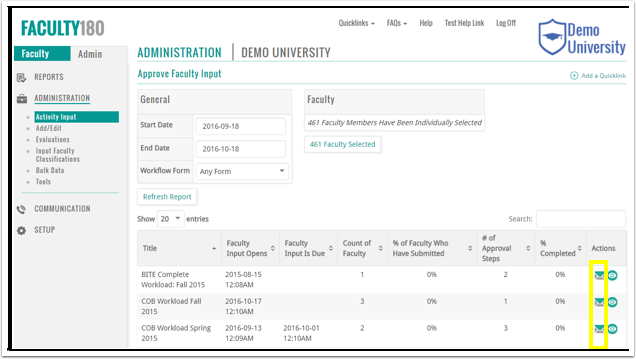 The Approve Faculty Input page displays. Click the view icon for the desired workflow. Click the view icon to approve the faculty input. For more information, refer to the attachment titled 'FACULTY180 AutoUpload Information' for specifics regarding the upload. The valid options are 'output=html' and 'output=json'. When no options are specified, will default to 'output=html'. The new option, 'output=html_clean' allows institutions to add their own styling to the vita. Added a 'Collaborative Evaluation' checkbox on the Create Evaluation Form page that will create a shared set of evaluation forms to allow multiple evaluators to edit the shared evaluation form. Only one author is allowed in a collaborative evaluation. In addition, there is no tracking to identify the evaluator who is saving the comments. Data entered into the form by the evaluators is inserted into the one author's record. NOTE: If the author list is changed, the evaluation MUST be saved BEFORE advanced author editing (clicking 'Author Settings') can be performed. Select the 'Collaborative Evaluation' checkbox (under 2 - Assign Evaluators & Schedule). Specify the Evaluators and Authors. Only one author can be assigned. Make any other changes, as needed. When finished, click the Save button to save the changes. Evaluators using the collaborative form will click the 'Evaluate' button, to edit and view the collaborative form. The faculty response section has been removed for those evaluations for which faculty were not given the option to respond. Previously, the faculty response section was displayed with the text 'No response given at this time'. The 'Evaluate' button text can be changed for self-evaluations and standard evaluations. Note: This change must be performed by FACULTY180. Clients should have their FACULTY180 administrator fill out a support ticket with the desired wording for the button. 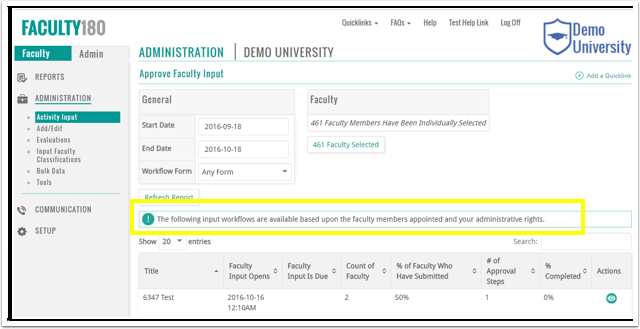 This enhancement applies to evaluations which use both custom evaluation forms and faculty classification input forms. A warning message will appear indicating 'Faculty Classification Input Forms may not have been submitted' if the Save button is clicked without completing the faculty classification input forms. Once the warning appears, click the Submit button to submit the evaluation or click the Cancel button to return to the form and complete the Faculty Classification Form. Edit the evaluation and click the Author Settings button (under 2 - Assign Evaluators & Schedule). From the Admin tab, click Administration > Evaluations. Use the filters to locate the evaluation. Click the edit icon for the evaluation you wish to edit. 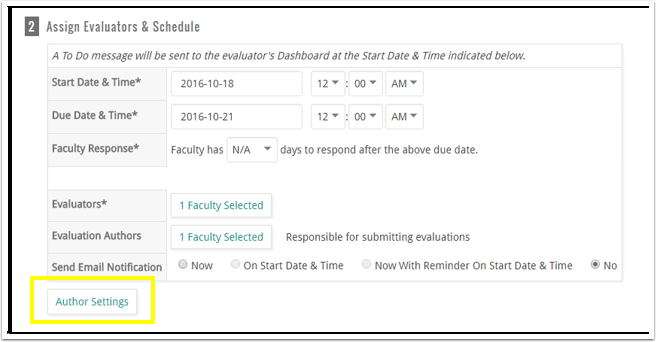 Scroll down to the section titled '2 - Assign Evaluators & Schedule'. Click the Author Settings button. Keep in mind that the time extension does NOT flow down through the evaluation steps. Therefore, if appropriate, the start and end dates/time for subsequent evaluations may also need to be adjusted. 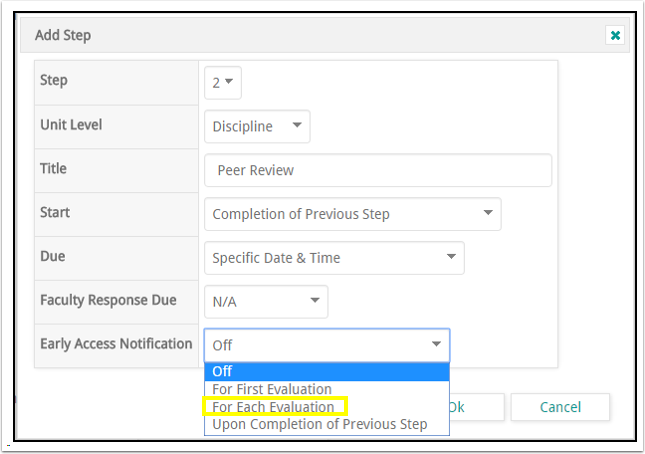 Within the Evaluation Workflow, if the option is selected for Early Access Notification, the text has been changed from 'for all evaluations' to 'for each evaluation'. When adding or editing a vita there is an option to Hide Activities Set to "No" in "Publicly Displayed", the default option is set to 'No'. 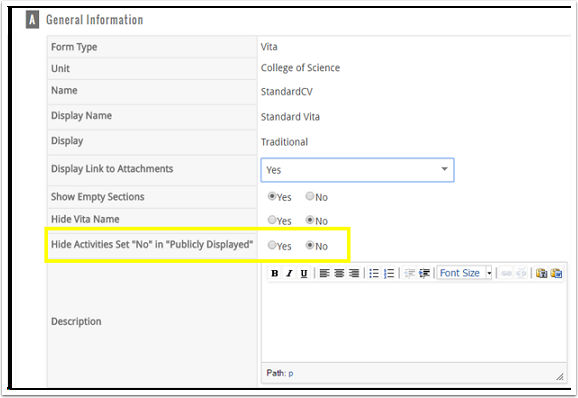 If this option is changed to 'Yes', any activities for which the Activity Classification 'Publicly Displayed' is set to 'No' will not display on the vita. Note: This option must be turned on in your database. If your institution is interested in using this new feature, please have your FACULTY180 administrator fill out a support ticket.